A large proportion of our Vaser Lipo Liposelection clients are men, with the most popular areas being the chest (see Gynecomastia section below), abdomen, lower back (love handles) and neck/jawline. The client pictured above had Vaser Lipo hi-def. If you want to learn more about Vaser Lipo Liposelection, please read through our comprehensive Frequently Asked Questions section. Clients who suffer from gynecomastia sometimes wait years before seeking treatment, often going to extraordinary lengths to mask their condition from others. 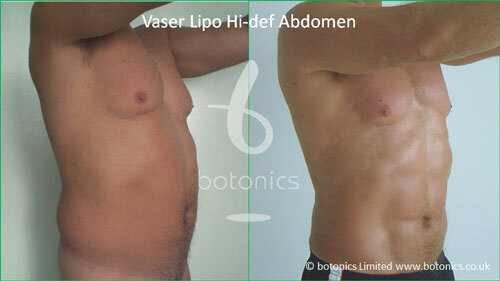 Before Vaser Lipo Liposelection, the only options involved painful, risky and expensive surgery. Treatment of gynecomastia with traditional liposuction requires a general anaesthetic, is painful, requires several weeks of downtime and usually leaves a scar. The client is often left with irregularities and a noticeable ridge between the treated and untreated areas. In some cases, gynecomastia can be successfully treated with Vaser Lipo Liposelection rather than resorting to more invasive procedures. Vaser Lipo Liposelection for gyne is permanent, safe, virtually painless, takes less than two hours and most clients can return to work the next day. It is done under a local anaesthetic and a fine, ultrasonic probe is used to emulsify the fat, so risks of complications are minimal compared to surgical alternatives. There is very little risk of scarring and support garments need only be worn for about two weeks. The results are consistently smooth and natural looking. Since Vaser Lipo Liposelection works at the cellular level, there is a smooth transition between the areas that are treated and the surrounding areas. The result is a normal, natural looking chest – which is what everyone deserves! A Vaser Lipo Liposelection treatment for gyne typically costs £2,400 and Financing is available. To determine whether your gynecomastia is likely to be treatable with Vaser Lipo Liposelection, all you need do is attend a consultation with your botonics surgeon. Your individual condition and likelihood of success will be thoroughly assessed free of charge.